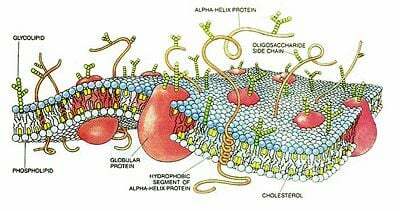 The cell membrane (or plasma membrane) is the thin outer layer of the cell that differentiates the cell from its environment. In animals, the cell membrane establishes this separation alone, whereas in yeast, bacteria and plants, an additional cell wall forms the outermost boundary, providing primarily mechanical support. As a semi-permeable barrier, the cell membrane maintains an essential balance between individual distinctness and communal interaction: it functions to retain key components of the cell and to keep out toxic or unwanted substances, while selectively controlling the flow of nutrients and biochemical signals into the cell. The cell membrane is composed mainly of phospholipid and protein molecules arranged in organized but flexible sheets. The phospholipid components form a bilayer that contributes structural stability and creates the semi-permeable environment, while the proteins are responsible for most of the dynamic processes carried out by cell membranes, such as the transport of molecules into and out of the cell. Transport across the cell membrane underlies a variety of physiological processes, from the beating of an animal’s heart to the opening of tiny pores in leaves that enables gas exchange with the environment. A major cellular manifestation of motor neuron disease is the inability of nerve cells to stimulate the opening of channels through the membranes of muscle cells, which would result in normal muscle function. The regulation of transport, though a crucial function of the cell membrane, is not its only role. Cell membranes assist in the organization of individual cells to form tissues. They are also involved in biological communication: the binding of a specific substance to the exterior of the membrane can initiate, modify, or turn off a cell function. The phospholipid shown has a polar head group (P) and a non-polar tail (U for unpolar). This amphipathic quality enables the phospholipid components of the cell membrane to self-organize into a lipid bilayer. The three major types of lipids found in the cell membrane are phospholipids, glycolipids, and cholesterol molecules. A phospholipid is composed of a polar head (a negatively charged phosphate group) and two non-polar tails (its two fatty acid chains). Phospholipids are said to be amphipathic molecules because they contain a hydrophilic (water-loving) head and two hydrophobic (water-fearing) tails. This amphipathic property causes multitudes of phospholipids suspended in water to organize naturally into a spherical, three-dimensional bilayer, which, becomes the cell membrane. Two phospholipid molecules in water will tend to join together via their water-fearing tails, and billions of them will cluster together side-by-side in the same fashion until the growing sheet curves back to make a closed sphere. The length and properties of the fatty-acid components of phospholipids determine the fluidity of the cell membrane. At reduced temperatures, some organisms may vary the type and relative amounts of lipids to maintain the fluidity of their membranes. These changes in membrane lipid components contribute to the survival of plants, bacteria, and hibernating animals during winter. Carbohydrate components are linked to lipids (to form glycolipids) or to proteins (glycoproteins) on the outside of the cell membrane. They are crucial in recognizing specific molecules or other cells. For example, the carbohydrate unit of some glycolipids changes when a cell becomes cancerous, which may allow white blood cells to target cancer cells for destruction. Extrinsic or peripheral proteins simply adhere to the membrane and are bound by polar interactions. Intrinsic proteins or integral membrane proteins may be said to reside within the membrane or to span it. They interact extensively with the fatty acid chains of membrane lipids and can be released only by agents that compete for these non-polar interactions. In addition, the cytoskeleton, which undergirds the cell membrane, provides anchoring points for integral membrane proteins. The protein components of cell membranes may function as channels or transporters across the membrane or as receptors of biochemical information. The relative number of proteins and lipids depends on the specialized function of the cell. For example, myelin, a membrane that encloses some nerve cells, uses properties of lipids to act as an insulator, and so contains only one protein per 70 lipids. In general, most cell membranes are about 50 percent protein by weight. The cell membrane is often described as a fluid mosaic—a two-dimensional fluid of freely diffusing lipids, dotted or embedded with proteins. The model was first proposed by S. Jonathan Singer (1971) as a lipid-protein model and extended to include the fluid character in a publication with Garth L. Nicolson in Science (1972). Proteins are free to diffuse laterally in the lipid matrix unless restricted by specific interactions, but not to rotate from one side of the membrane to another. Rather than presenting always a formless and fluid contour, however, the surface of the cell membrane may show structure. Synapses, the junctions between nerve cells, are one example of a highly structured membrane. As the cell membrane is semi-permeable, only some molecules can pass unhindered into or out of the cell. These molecules are typically either small or non-polar. The cell membrane has a low permeability to ions and most polar molecules, with water being a notable exception. There are two major mechanisms for moving chemical substances across membranes: passive transport (which does not require the input of outside energy) and active transport (which is driven by the direct or indirect input of chemical energy in the form of ATP). Simple diffusion of hydrophobic (non-polar) and small polar molecules through the phospholipid bilayer. Facilitated diffusion of polar and ionic molecules, which relies on a transport protein to provide a channel or bind to specific molecules. Channels form continuous polar pathways across membranes that allow ions to flow rapidly down their electrochemical gradients (i.e., in a thermodynamically favorable direction). Primary active transport involves the direct participation of ATP. In secondary active transport, energy derived from the transport of a molecule (such as sodium) in the direction of its electrochemical gradient is used to move another molecule against its gradient. In general, active transport is much slower than pasive transport through channels. The processes of endocytosis, which bring macromolecules, large particles, and even small cells into a eukaryotic cell, can be thought of as examples of active transport. In endocytosis, the plasma membrane folds inward around materials from the environment, forming a small pocket. The pocket deepens, forming a vesicle that separates from the membrane and migrates into the cell interior. In exocytosis, materials packaged in vesicles are exported from a cell when the vesicle membrane fuses with the cell membrane. Organization. Some receptors on the external surface of the cell membrane participate in the grouping of cells to form tissues (cellular adhesion). Information processing. Membrane proteins may act as receptors for the various chemical messages that pass between cells. The movement of bacteria toward food and the response of target cells to hormones such as insulin are two examples of processes that hinge on the detection of a signal by a specific receptor in a cell membrane. Enzyme assembly. Cell membranes can serve as an assembly that organizes the specific enzymes involved in a given metabolic pathway. Binding the enzymes to the membrane in sequential order enables the series of chemical reactions in the pathway to be carried out efficiently. Biological communication. 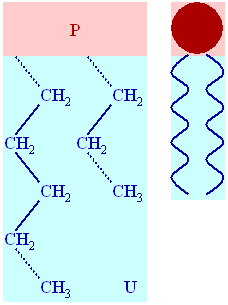 Some membranes generate chemical or electrical signals. Cell membranes of nerve cells, muscle cells, and some eggs are excitable electrically. In nerve cells, for example, the plasma membrane conducts the nerve impulse from one end of the cell to the other. Purves, W., D. Sadava, G. Orians, and C. Heller. 2004. Life: The Science of Biology, 7th edition. Sunderland, MA: Sinauer. Stryer, L. 1995. Biochemistry, 4th edition. New York: W.H. Freeman. Tsuneshige, A., K. Imai, and I. Tyuma. 1987. “The binding of hemoglobin to red cell membrane lowers its oxygen affinity.” Biochemistry 101(3): 695-704. This page was last modified on 29 August 2008, at 13:30.